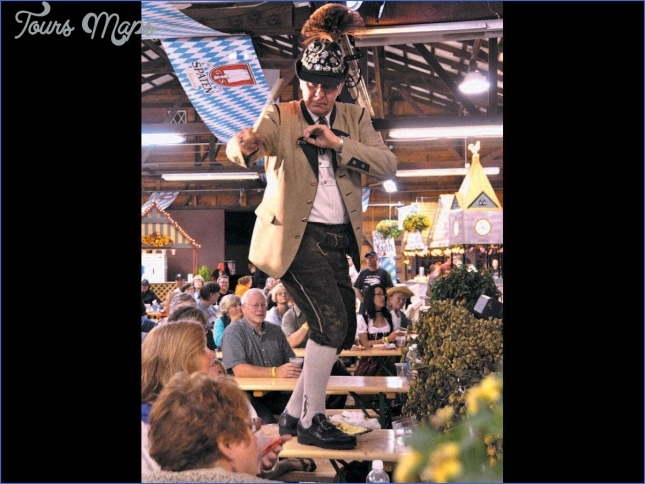 Oktoberfest celebrations are ubiquitous; annually Oregon hosts perhaps a dozen or more such events at venues ranging from major cities to individual pubs. But the Mount Angel Oktoberfest, launched in 1966, is special—a massively popular, event-rich feier (to use the German word for “celebration”) that offers wonderful entertainment for all ages each September. Oktoberfest takes over the festively kept little community of Mount Angel for four days, drawing nearly 400,000 people each year. Attendance is essentially mandatory for anyone who loves festival events in Oregon. 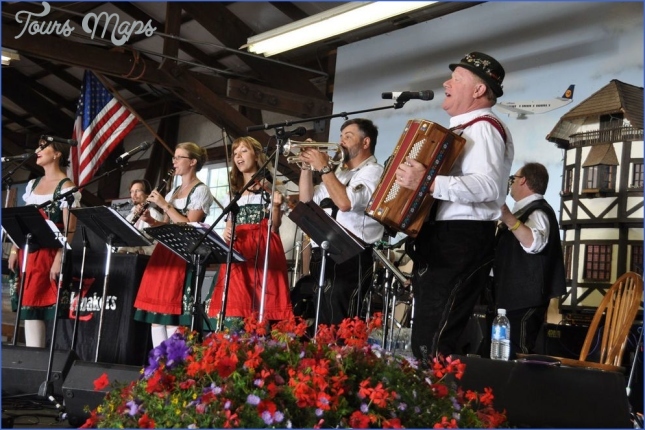 Entertainment in the form of amazing musicians, including Bavarian and Alpine bands brought to the festival from far and wide, are a highlight of the Mount Angel Oktoberfest, taking the stage at a variety of venues. Each entertainment venue has a unique atmosphere and entertainment style. Find your favorite depending upon your mood (venue hopping is highly encouraged). Three of the venues—Biergarten, Weingarten, and Alpinegarten—require a cover charge, or simply purchase a wristband that allows admission to all three. There is never a charge for people under 21 years old, but there are slightly restricted hours in the Biergarten and Weingarten for those under 21. Biergarten is especially popular for the traditional Bavarian beers on tap, alongside special craft brewers. The Weingarten recreates the essence of a traditional Continental wine festival, with myriad wines from both Germany and Oregon, but includes a fine selection of beers as well. Alpinegarten offers interactive entertainment for the whole family along with an excellent selection of both German and regional beers and wines. 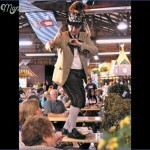 The longstanding Mount Angel Oktoberfest is one of the biggest such events in the West. The Prostgarten is a hidden treasure in Downtown Mount Angel, at the corner of Garfield and College Streets behind the Glockenspiel and a row of food booths. Inside the Prostgarten you will hear gentle acoustic accordion music that allows for easy conversation while you enjoy a German beer—or, rather, a “bier”—and German wines. Bring your food favorites from the outside food booths, take a seat under the tent or on the enclosed patio, have a chat with friends, and watch the crowds go by in this quiet downtown sanctuary. The other entertainment venues include the outdoor Bandstand, scene of the ever-popular Friday and Saturday night street-dance parties, and the beautiful Saint Mary’s Catholic Church (built in 1912), which hosts choral groups, alpenhorn players, harp and flute music, and fine organists playing spiritual and uplifting music while guests marvel at the church’s stained glass and statuary. Oktoberfest also has an extensive, fun-filled free Kindergarten for kids and families. In addition to the entertainment venues, Oktoberfest includes a bedazzling array of foods available from numerous vendors. Naturally, Bavarian and German favorites are well represented—sausage, brauts, sauerkraut, Ruben and Berliner sandwiches, spatzle, and much more. 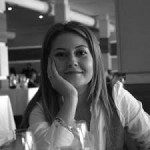 They’ll compete for your taste buds with local fare, including fish tacos, Marionberry cobbler, Russian perogies, and many typical festival foods. The food booths are run as fundraisers by a variety of local organizations, civic services, schools, churches, and clubs. The Oktoberfest website offers a map of the Alpine Food Chalets, as the food court is called (it stretches through town). 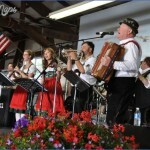 Moreover, the festival includes a massive arts and crafts vendor section featuring more than 120 artisans offering all kinds of handcrafted products and Bavarian-themed products. What you won’t find are commercial products or political-organization booths. Oktoberfest, by design, is a time for joy, celebration, and gemutlichkeit, the German word meaning a situation that induces a cheerful mood, of belonging and social acceptance, and unhurriedness—this is not the place for political statements or dissension. 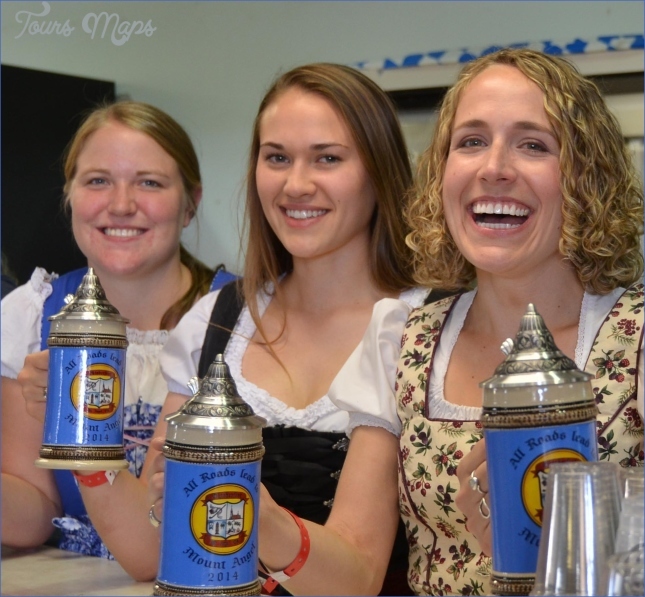 Mount Angel Oktoberfest also provides an array of special events beyond the entertainment venues and bier gardens. Among them are a variety of footraces on Saturday, including a half marathon; classic car shows; the Sunday morning Volkswalk, a noncompetitive walking event completed at an individual’s pace following a map and signage; and the hilarious and supremely popular wiener dog races held both Saturday and Sunday. Mount Angel is rich in Bavarian culture. Many building facades are adorned with fachwerk (exposed beams), flower baskets, and wrought iron. 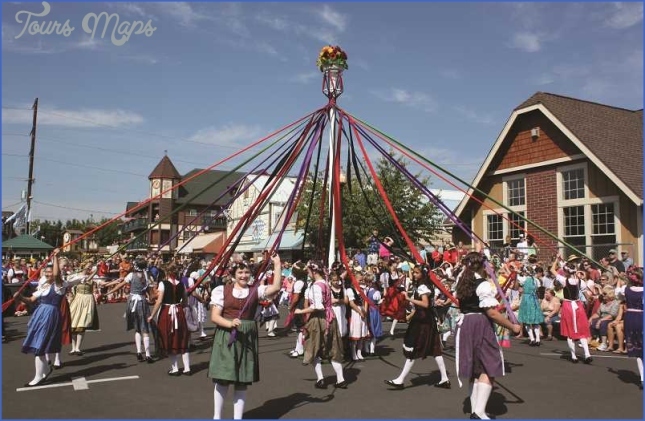 The town boasts the Maibaum—a Tree of Trades traditional in Bavarian Villages. 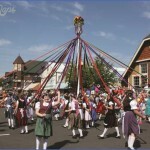 Don’t miss the Glockenspiel, which displays the town’s history rather like a large cuckoo clock. During Oktoberfest locals pull out all the stops, dirndls (festive lady’s dresses) and lederhosen (men’s leather pants) abound; flower wreaths in their hair, the Mount Angel School children dance the Webertanz (Weaver’s Dance). 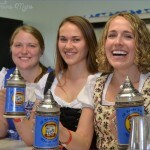 Many activities at Mount Angel’s Oktoberfest are free, and only three venues require admission. Admission (for adults) is nominal, with daily passes varying slightly in price based on the day and time. The event also offers an inexpensive all-festival pass. Parking is available at two lots, one north of town and one south. Both lots are serviced by shuttles, which drops attendees at the heart of the festival and return to the parking areas about every fifteen minutes. Street parking is also available, and check the maps for handicap parking.